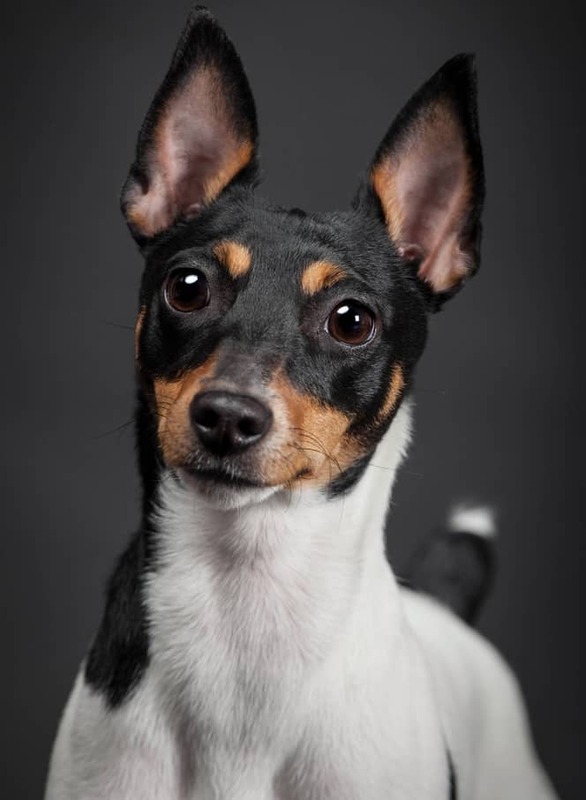 The Toy Fox Terrier temperament makes him a spry and intelligent dog. Because of this, Toy Fox Terriers and Rat Terriers are often compared to each other. 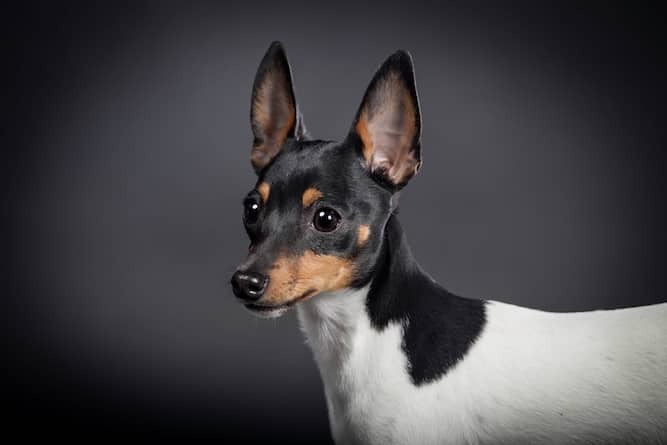 The key thing to remember when considering Toy Fox Terrier vs Rat Terrier is that the Toy Fox Terrier has a more territorial temperament. He thinks nothing of taking on bigger dogs who want to challenge his territory. When it comes to playtime, the Toy Fox Terrier can become deeply focused on whatever he is doing. He is also impulsive, running and jumping about whenever the urge strikes him to do so. He loves to chase the ball around outside, and he finds plenty of ways to keep himself busy inside, with toys and running around. He has a lifelong play streak, and he enjoys indulging in it. You will get plenty of belly laughs watching him do a variety of things to keep himself entertained. He especially loves to play fetch. This is the terrier side of him that enjoys the thrill of the hunt. The Toy Fox Terrier is thoroughly loyal to his family. He loves fewer things more than to be around his humans. 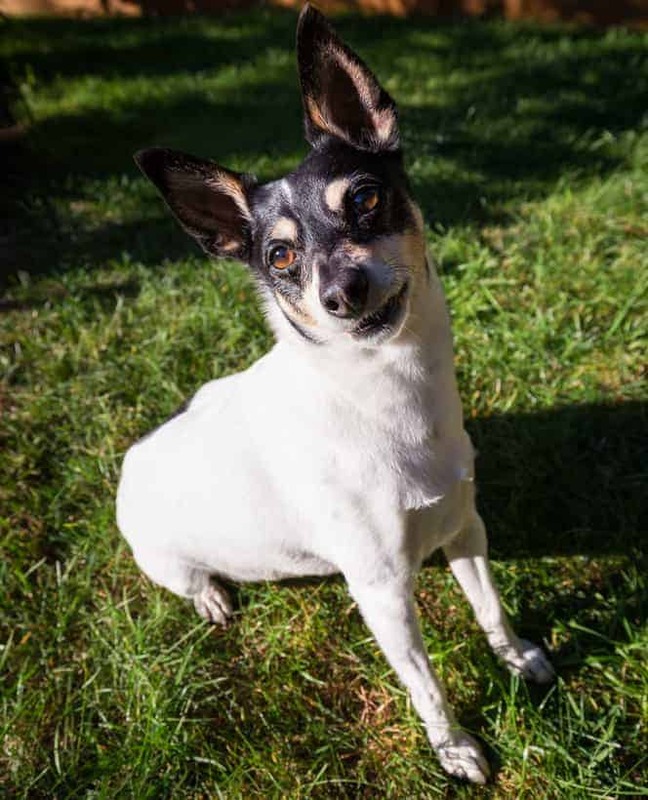 The Toy Fox Terrier’s eyesight is as good as his hearing, which makes him a standout watchdog who will alert you at anything he may find suspicious. He has a sharp bark, which is intimidating to strangers, despite his smaller size. The Toy Fox Terrier is the embodiment of a scrappy little dog. He’s quick to bark, chase, and boss around other dogs when engaged in play. However, in addition to these “Terrier” traits, the Toy Fox Terrier lives up to the “Toy” in his name, too. He can sometimes show his quieter side, and he loves when you hold him. Because of the Toy Fox Terrier’s high intelligence level, he is very easy to train, compared to other breeds. However, he’d much rather learn fun tricks than any of that more important stuff, like housetraining and when to use his bark. Interestingly, female Toy Fox Terriers tend to learn housetraining quicker than males do. Males may actually do better with a litter box because they often have trouble hitting their target with a potty pad. The Toy Fox Terrier is an outgoing and friendly dog. He’s especially great with cats. He loves to curl up with them and play with them – even fatter cats who are bigger than him! Some breeders are able to pinpoint the Smooth Fox Terrier – a.k.a. the “Foiler” – as the Toy Fox Terrier’s ancestor. The Foiler was the first Fox Terrier that Britain’s Kennel Club registered. This happened in 1875-76. The United Kennel Club (UKC) officially recognized the Toy Fox Terrier as a breed in 1936. However, the American Kennel Club (AKC) did not officially recognize the breed as a member belonging to the Toy Group until 2003. Because of his smaller size, the Toy Fox Terrier is perfect for apartment living, so long as he gets plenty of outside time. Because Toy Fox Terrier puppies can do so well indoors, you can choose which method of housetraining you prefer. Specifically, you can train him to use potty pads indoors or to go outside. You may find potty pads to be especially helpful during days when the weather is poor. This way, you don’t have to worry about him being messy from, or terrified of, the rain or snow. For help with training your Toy Fox Terrier dog, you should take a look at The Online Dog Trainer by Doggy Dan. Doggy Dan is an expert Dog Trainer based in New Zealand. His online resource contains Hundreds of Excellent Dog Training Videos that will take you step-by-step through the process of developing a healthy, happy well-behaved dog. You will also learn how to easily teach your Toy Fox Terrier new tricks. If you’re not a huge fan of regular grooming, then the Toy Fox Terrier is a good match for you. His coat barely needs any maintenance, with the occasional brushing to prevent shedding. You do not need to bathe him frequently either, only when he starts to get that doggy smell. If possible, start trimming his nails at a young age. That way, he will be less resistant to it as an adult. it's good to have an idea of what is considered a healthy size and weight. That way you can more easily notice early signs of poor health and nutrition which often can manifest in under or overweight or stunted growth. The average Toy Fox Terrier weight is between 3.5 and 7 lbs. He’s a tiny thing! And the average Toy Fox Terrier size is between 8.5 and 11.5 inches tall. The Toy Fox Terrier lifespan is between 13 and 14 years. That’s pretty long for a dog! Note: To further help you spot the signs of poor health or straight-up diseases in your Toy Fox Terrier get a copy of The Ultimate Guide to Dog Health. And read it. It will save you money (fewer Vet visits) and may even help you save your dog's life. The Toy Fox Terrier loves to jump and dart around. He’s an energetic little soul. In fact, his lifelong high energy level and zest for life make him especially appealing to children. However, like all small dogs, you should not have the Toy Fox Terrier around younger children. The dog is more likely to suffer an injury from a child playing with him too rough. When it’s raining, and he’s not getting his exercise outside, he’s perfectly happy to run laps around the house. Interested in learning how to add a Toy Fox Terrier puppy to your family? Read on. You can find a Toy Fox Terrier for sale either from a breeder or through a rescue or adoption agency. Most, if not all, of these agencies, should have Toy Fox Terrier images on their websites of the dogs they have available. The average Toy Fox Terrier price is between $400 and $600. The price of a Toy Fox Terrier for sale can change, depending on where you get it and how much a breeder decides to charge. If you would like to adopt a dog, you can find Toy Fox Terriers for sale through your local rescue organizations or adoption centers. 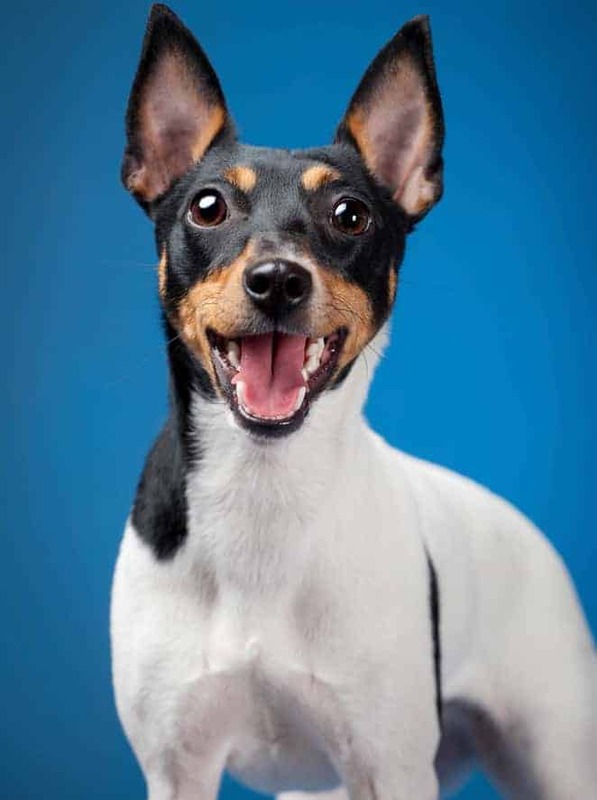 A Toy Fox Terrier adoption will always be a more affordable option than purchasing a puppy from a breeder. However, an adopted dog is often a better choice if you would rather skip the puppy stage altogether and get an older dog. You are much better off going with a breeder who is local. This way, you can visit the home of the breeder and make sure the conditions the dogs are kept in is clean and treatment at a high standard. The breeder should be ready, willing, and able to answer all of your questions. So come prepared to actively engage with the breeder about the specific Toy Fox Terrier and its parents. If the breeder does not openly share info with you or show concern about how you will treat your new Toy Fox Terrier pup, then run from that breeder and look for a new one. It is also a myth that you should choose the most active puppy in the bunch. The most active puppy may also be the most aggressive one. Calmer puppies are not necessarily sick – they may just be calmer dogs. Look instead for other telltale signs of sickness, like lethargy, an unkempt coat, or watery eyes. Conclusion: Why the Toy Fox Terrier? Life is never boring with a Toy Fox Terrier. He has a consistently high energy level which, as is customary for smaller dogs, sticks with him for life. And it’s a long life, too! Toy Fox Terriers can live up to 14 years, though there are certain health problems you need to watch out for. The Toy Fox Terrier is a friendly and loyal dog who is just as much Toy and he is Terrier. He can be scrappy and aggressive toward other dogs who challenge him, but he loves when his family holds and carries him. 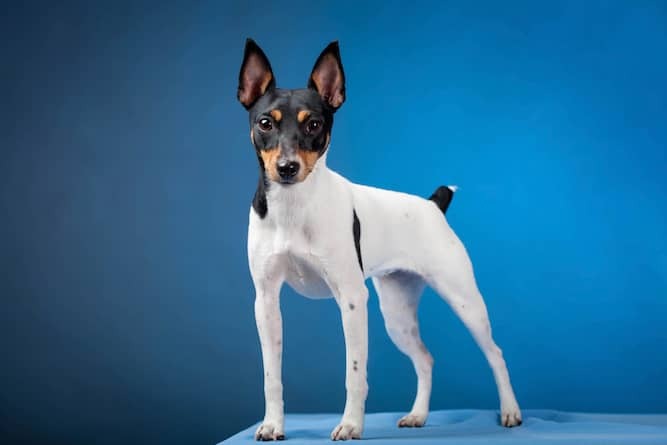 Grooming and training him are both easy-peasy tasks, so if you want a dog that isn’t high maintenance, then you and the Toy Fox Terrier will make a great match! Next post: Bearded Collie Temperament (Lively, Intelligent, Confident) Keeping Up! Previous post: Does The Wirehaired Vizsla Temperament Make It a Near Perfect Family Dog?